At The Special Branch Arborist we are all “greenies” and don’t like seeing trees being cut down for profit. Lots of trees have been completely removed for profit either by the person who cut it down, usually a tree lopper collecting payment for the job or sometimes by greedy developers who like to build apartments/units on land which at one time had a tree on it. Enough said…. you get the picture… we really love trees! We have vast experience in removing trees that cause damage to properties. Removing trees from around existing structures is very common as they can cause problems to the foundations or plumbing. Storm Damage is another common issue where you may need our Tree Removal service. We have successfully removed hundreds of trees, plants or stumps that are in problem areas, however we have also refused to cut down trees because no damage to property was being done or the trees were posing no threat. Our Tree Pruning or Tree Shaping services are more beneficial. We are professional, efficient and careful when it comes to the removal of dead or dying trees. 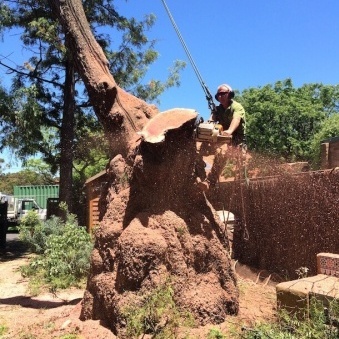 We treat and remove trees that cannot be saved – In some cases this can be a very big job! We also understand that in some cases the wrong species of tree has been planted or you might want to reinvent your garden. We offer the Tree Removal service alongside our Tree Planting or Re-Planting service. Contact Us to see what we can do for you, after all – everyones needs are different. You can feel confident knowing we have all the necessary equipment, knowledge and experience to remove your tree safely and professionally.